New York, NY - The world famous Lotte New York Palace has selected Tambourine to provide marketing and digital services. Located on Madison Avenue, Lotte New York Palace was named one of the “Top Hotels in NYC” in 2017 according to Conde Nast Traveler. “After an extensive global search amongst the leading hotel marketing firms, we are confident to have selected Tambourine as our marketing partner,” said Becky Hubbard, General Manager at Lotte New York Palace. LOTTE New York Palace, a luxury midtown hotel on the corner of 50th & Madison, was acquired by LOTTE Hotels & Resorts on August 28, 2015. Previously, the property completed a $140 million redesign in the fall of 2013. The renovation transformed the property’s premier rooms and suites in The Towers, a hotel-within-a-hotel. Additional upgrades included new lobbies, specialty suites and restaurants and bars including Trouble’s Trust, The Lobby Lounge, Tavern on 51, Rarities and Pomme Palais. In addition to 30,00 square feet of updated event space, The Palace is home to private spaces located in the historic Villard Mansion that feature 19th century interiors and are ideal for lavish weddings, events and dinners. With 909 rooms and suites, The Palace is known for unparalleled splendor, spectacular views, spacious rooms and exquisite service. 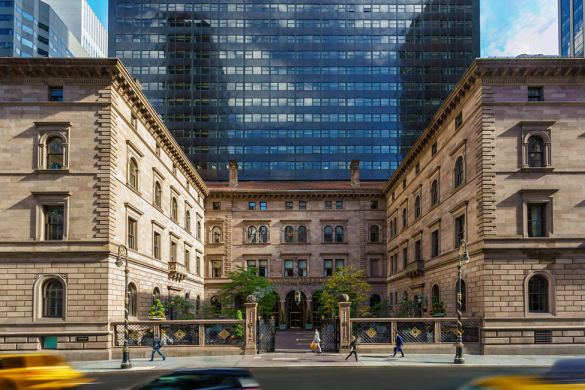 Located across the street from St. Patrick’s Cathedral and only steps from Rockefeller Center – the hotel’s world-renowned courtyard incorporates motifs from several 15th-century Italian cathedrals and has served as the entranceway to the historic Villard Mansion since 1882. LOTTE New York Palace gracefully blends the landmark Villard Mansion with a contemporary 55-story tower. Guests can reserve accommodations online at http://www.lottenypalace.com or contact reservations at 1-800-NY-PALACE (1-800-697-2522). LOTTE Hotels & Resorts are currently in operation of 18 properties across five countries globally and have 16 more properties in the pipeline. LOTTE Hotels & Resorts have secured their brand equity by way of their award-winning Five Star properties. Their first luxury and overseas hotel from Korea’s hotel brand in Russia has been in the spotlight after being recently awarded with the Prix Villegiature Awards ‘Best Hotel in Europe’. LOTTE Hotels & Resorts has gained worldwide recognition for its excellent service and facilities suitable for major international events. It has also been rated as the best hotel in Korea by numerous prestigious magazines, including Conde Nast Traveler, Global Traveler, Business Traveller (Asia Pacific), and Trade Travel Gazette.